Syracuse, NY: Dehler Press, 1922. Bound in ribbed black cloth, stamped in gold (faded but readable). Previous owner's neat bookplate to front pastedown. The very scarce first edition of this desirable copy of the history of the Six Iroquois Nations of New York. Lots of reprints out there -- but this is the true first edition -- no copies on OCLC/Worldcat. 247 pp. + index. . First Edition. Hard Cover. Very Good +/No Jacket. Phoenix, AZ: Indian Tribal Series, 1973. 38 (out of 40) matching volumes - all bound in thick blue wraps. Each volume is signed by each unique tribal chief at the time of publication. Each volume is the history of a certain tribe. This set is #3135 (out of 15000). Handsome set -- including Apache People, Cherokee, Chickasaw, Chippewa - Minn, Chitimacha, Choctaw, Cocopah, Comanchie, Coushatta, Creek, Crow, Florida Seminole, Havasupai, Hopi, Kalispel, Kaw, Kenaitze, Kickapoo, Mescalero Apache, Modoc, Narraganset, Navajo, Oneida, Osage, Otoe-Missouria, Ottawa, Papago, Pawnee, Ponca, Potawatomi, Quapaw, Seneca, Sioux, Southern Ute, Three Affiliated Tribes, Walapai, Wichita, Yakima, et al -- missing the Eskimo and Paiute volumes. Extra postage required. . Signed by Author. First Edition. Soft Cover. Near Fine/No Jacket - As Published. Illus. by Photo Illustrated. 8vo - over 7¾" - 9¾" tall. UK: Folio Society, 2007. Bound in brown buckram, sepia photo of Native American on front panel; in matching slipcase. An "as new" copy of the first Folio Society printing. 496 pp. Rather scarce first Folio printing. . First Edition Thus. Hard Cover. Fine/No Jacket - As Published. Philadelphia: David McKay, 1882. Bound in original dark brown cloth, stamped in gold. A tight, clean copy of this 100 pp. book on the Treaty . . . with advertisements at end of book. Green endsheets, previous owner's neat name to front free endpaper. . First Edition. Hard Cover. Very Good +/No Jacket. 8vo - over 7¾" - 9¾" tall. HAND BOOK OF TRIBAL NAMES OF PENNSYLVANIA TOGETHER WITH SIGNIFICATION OF INDIAN WORDS. Also A History of Great Council of Pennsylvania. With Articless Pertainig to the Improved Order of Red Men. Philadelphia: Thomas K. Donnally, 1908. Bound in red cloth, stamped in gold (spine faded). A decent copy of this 320 pp. book on Native Americans of Pennsylvania. Quite scarce. Interior pages are in very good condition. . First Edition. Hard Cover. Good +/No Jacket. Harrisburg: Clarence M. Busch, 1896. Volumes are bound in original navy blue cloth, stamped in gold. The cover on volume 2 shows a bit of mottling, but both volumes are tight and clean. The interior pages are near fine as are all of the pull out maps. 627 pp. / 636 pp. Both volfumes have stamp noting that the set was a gift from a PA Representative. Previous owner's tiny bookplate affixed to front pastedown. Unusually nice set. . First Edition. Hard Cover. Very Good +/No Jacket. 8vo - over 7¾" - 9¾" tall. New Hope, Pa.: Self-produced, 1965. Bound in stiff white wraps, stamped in red and black A rather scarce book on Native Americans in Bucks County. 32 pp. + a great fold out map of indian camps in the county. . First Ediiton. Soft Cover. Very Good +/No Jacket. NY: Berkley / Colorado, 1995. This is a run of Ms. Coel's first sixteen books, books include: The Eagle Catcher, The Ghost Walker, The Dream Stalker, The Story Teller, The Lost Bird, The Spirit Woman, The Thunder Keeper, The Shadow Dancer, Killing Raven, Wife of Moon, Eye of the WOlf, The Drowning Man, The Girl with Braided Hair, Blood Memory, The Silent Spirit and The Spider's Web. All First editions (save for The Eagle Catcher -- which is a second printing), all in bright dust jackets and all Signed on the Title page by the author. A handsome set. . Signed by Author. First American Edition. Hard Cover. Near Fine/Near Fine. 8vo - over 7¾" - 9¾" tall. Clarkston, MI / Mission Viejo, CA: ASAP, 1999. Ten matching volumes in varying colors of cloth. All have a color photograph of the author. Each is signed by the author and the illustrator and the author who wrote the introductions for the series. Author's include Tony Hillerman, Marcia Muller, T. Jefferson Parker, Jan Burke, et al. Each is limited to either 250 or 300 copies. Quality productions and rare in the complete ten volume set. Most books are approximately 20 pages. . Signed by Author. First Edition. Hard Cover. Fine/No Jacket - As Published. Illus. by Phil Parks. 4to - over 9¾" - 12" tall. Limited Edition. Cincinnati: Press of the Robert Clarke Company, 1904. Bound in light brown cloth, has dark brown marbled end papers and shows a small darkened area to spine with lightly bumped spine ends and slight scuffing to corners. 309 pgs. Overall, a tight, clean and bright copy. . First Edition. Hard Cover. VG++/No Jacket. Arizona: The Navajo Tribe, 1968. Bound in blue cloth with front panel showing gold & black lettering and native decoration; black & gold lettering to spine. Shows slight splaying with a lean to the right. 107 pgs. First Edition. Hard Cover. VG+/No Jacket. 4to. NY: Macmillan & Co., 1970. This is a review copy with review slip and blurb sheet from the publisher laid in. The follow up book to the author's first book - Custer Died for Your Sins. Some toning to page edges, but overall, a very decent copy of the author's second book. 227 pp. . First Edition. Hard Cover. Very Good ++/Very Good +. 8vo - over 7¾" - 9¾" tall. Review Copy. NY: Viking, 1983. Spine of dust jacket is faded, but still certainly readable. Overall, a decent copy of this first edition. This is the true first edition of this once-suppressed book re: the Government and their ongoing war against the Native American population. Superlative investigative reporting. 628 pp. . First Edition. Hard Cover. VG++/Very Good - Price-clipped. London: L. King, 1997. Bound in stiff glossy wraps with a huge picture of a Native American on the front panel. Quality production of this reprint of the original edition. 176 pp. . Reprint Edition. Soft Cover. Very Good ++/No Jacket. 4to - over 9¾" - 12" tall. NY: St Martins Pr, 1995. Bound in black cloth and tan boards, stamped in bronze. A 245 pp. 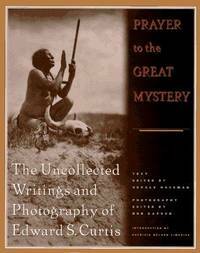 book on the works of Edward S. Curtis, famous photographer of Native Americans. . First Edition. Hard Cover. VG + /VG +. 8vo - over 7¾" - 9¾" tall. New York, New York, U.S.A.: Facts on File, 1993. Bound in black cloth, stamped in gold -- in matching dust jacket. A very attractive production of 240 pp. book on The Navajo -- the largest group of Native Americans in North America. . First Edition. Hard Cover. Near Fine/Near Fine. 4to - over 9¾" - 12" tall. Bethlehem: Times Publishing, 1923. Bound in dark blue cloth, with one drip stain to top of front panel. But overall, this book is tight and clean with no other discernible flaws to either the binding or the pages. Quite remarkable for a 90+ year old book. Scarce. 331 pp.. First Edition. Hard Cover. Very Good +/No Jacket. 8vo - over 7¾" - 9¾" tall. Bethlehem: Times Publishing, 1917. Bound in dark green cloth, stamped in gold. A very nice copy of this first edition on Moravian Ministries and their work in the Midwest. No discernible flaws. 180 pp. . First Edition. Hard Cover. Very Good +/No Jacket. 8vo - over 7¾" - 9¾" tall. NY: Viking, 1983. Spine of dust jacket is faded and the book has a remainder stripe to bottom edge. Overall, a tight, clean, presumedly unread copy. This is the true first edition of this once-suppressed book re: the Government and their ongoing war against the Native American population. Superlative investigative reporting. 628 pp. . First Edition. Hard Cover. VG++/VG+. Chemawa, Oregon: Salem Indian School, 1926. Published by the Dept. of the Interior, Office of Indian Affairs (Bulletin 1926-#2). a 7-page pamphlet.. Ex-Lib copy with typical marks bound in new stiff wraps. Exceedingly scarce (only 3 copies on OCLC). . First Edition Thus. Soft Cover. VG/No Jacket.